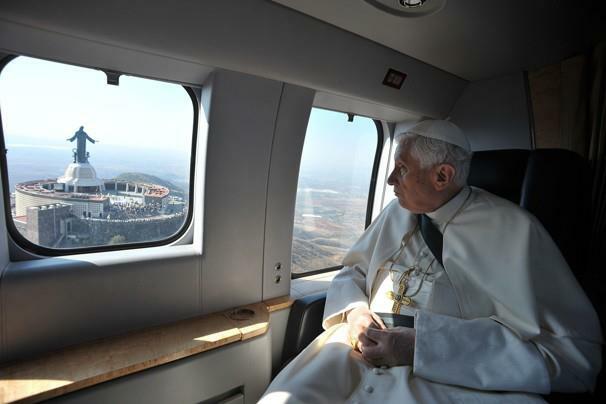 And the Pope is off into the air flying to Castel Gandolfo. Have a safe flight, your holiness!! And the 5 o’clock bells are ringing. . . Including the biggest St. Andrew bell wishing him goodbye! All of the bells of St. Peter’s. tolling goodbye to the successor of Peter. Chilling and inspiring! The helicopter becomes Shepherd 1. If you tune into EWTN you can watch his helicopter fly via another helicopter following. The bells just add to the uniqueness of this event. He is landed and disembarking the helicopter, preparing to head to Castel Gandolfo now.